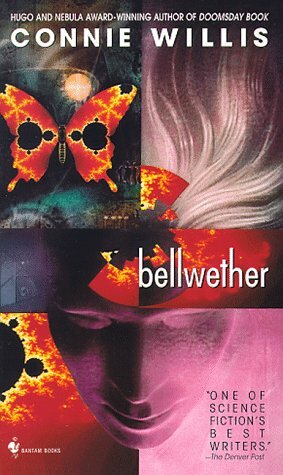 And the randomly selected winner is Bellwether by Connie Willis, as suggested by ladyjoust! This is pretty cool because I read (and really loved) Willis' Doomsday Book years ago and it will be fun to read more by an author I have not visited in some time. Hilariously enough, I have actually not read Unwind , which was touted by a couple of you but not actually suggested! Maybe next time. Thanks again. Onward and upward! I love that all of the books that you've picked so far for these were new to me at the time. Doomsday Book is one of my all time faves, so I have been meaning to read more Connie Willis forever. Can't wait to see if you recommend this one or not. Oh, I enjoy Bellweather very much! I hope you like it too! Jacqueline, wonderful! I love the breadth of suggestions I get and the heads up on the new-to-me authors I should be reading. Lenore, seriously? That makes me happy. I love that book. Could not put it down. Woo! I hope you enjoy! @Lenore - you absolutely MUST read To Say Nothing of the Dog. I just recently read To Say Nothing of the Dog by Connie Willis and absolutely loved it, so one of these days I plan to read more from her. ladyjoust, so do I! I plan on going to get it tomorrow. Marg, I actually have a copy of TO SAY NOTHING OF THE DOG. May have to jump into that one after I finish BELLWETHER. Oh I didn't know you've read Dragon Bones already! What did you think of it? I have a feeling you like her urban fantasy books more though. Chachic, I definitely enjoyed it. And I keep meaning to grab DRAGON BLOOD and find out what happens to Ward and the rest. I got THE HOB'S BARGAIN for my birthday as well and I can't wait to read it and see what I think of the straight fantasy after loving the urban fantasy she's done.